Been a long time since I made my last update. Between moving, family matters, work, and superstorm Sandy, haven’t spent any time upstate this year. Despite those issues, things are going well. I’m able to practice bow in my new apartment (via scaled-down deer targets and a large foam cube). After a month hiatus, I’ve gotten back into the swing of things at the gym. The dearth of options on seamless in my new neighborhood has once again increased my interest in cooking. On the cooking front, I made some lamb today that was delicious. It was easy too. 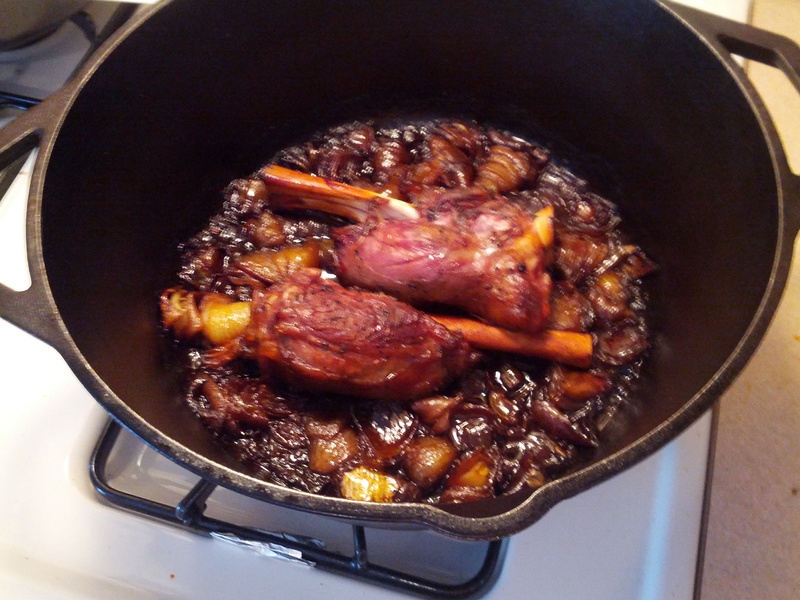 I heated some rendered bacon fat in a dutch oven, then I seared a pair of lamb shanks until the exteriors were browned, then I surrounded them with coarsely chopped onions. I made a braising liquid out of Shaoxing Wine, Chili Garlic Paste, salt, pepper, sichuan peppercorns, and dark soy sauce and poured it over the meat. Added a bit of water so that the liquid was half-way up the lamb. Then I threw the whole mess into a 350F oven for about two and half hours with the lid on. The result was close to perfect. The lamb was fall off the bone tender and it had just a bit of a spicy kick. ← Not going to be cold this year.